OneCNC Deutchland attended this show to demonstrate the OneCNCXr2 range of products. A very busy show and in attendance was Uwe OneCNC Germany, Stephan OneCNC Germany, Sebastian OneCNC Poland, Allan OneCNC Denmark and Bob OneCNC Australia. The 14th edition of EuroMold, the world fair for mould making and tooling, design, and application development, was pronounced successful by the exhibition management organization DEMAT GmbH. 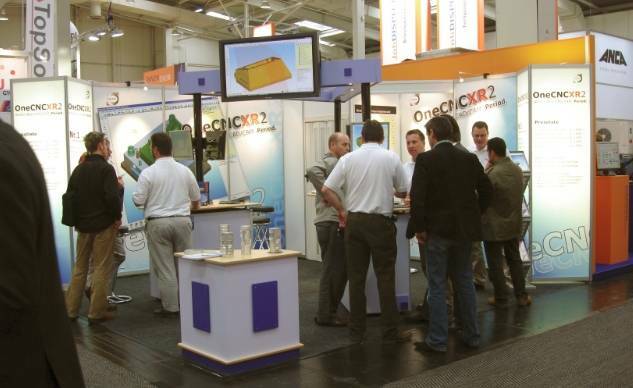 EuroMold 2007 attracted 61,720 industry visitors from 83 countries to Frankfurt. The visitor turnout represented a 2.1% increase over the 2006 attendance. Embodying the conceptual slogan “From Design to Prototyping to Series Production,” EuroMold again presented the full industrial process chain, showcasing exhibitors from all the relevant industrial sectors. 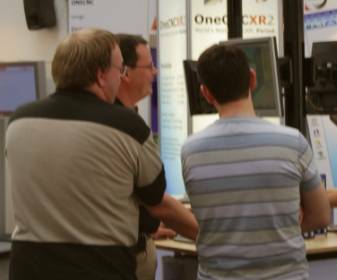 Fair attendees could discuss the realization of an idea with designers, the optimization of process flow and possible cost reductions with simulation experts, and the advantages and disadvantages of various material choices with specialists in materials supply. 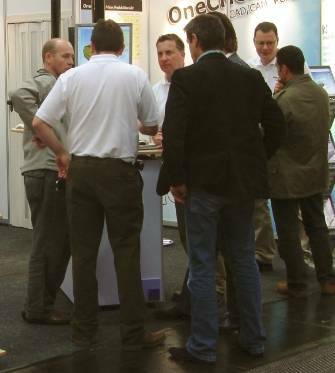 Every day was busy for all demonstrating continulusly throughout the show. 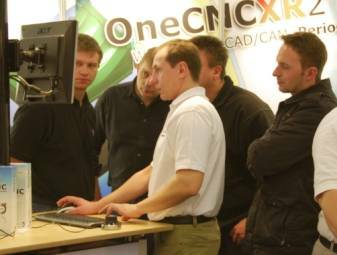 Here we see Uwe OneCNC Germany (left) demonstrating OneCNCXR2 to a customer. 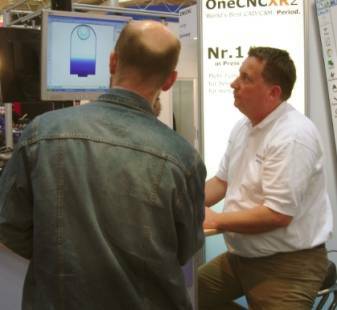 Euromold being a specialist mold show brings many users directly interested in mold manufacture and OneCNC is fortunate to have experienced staff on hand. 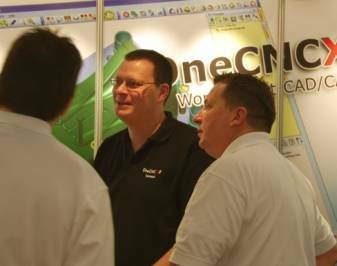 Here Stepan OneCNC Germany (left) demonstrating the product to Thomas (middle) a long time customer and user of OneCNC in Germany. Sebastian OneCNC Poland eagerly looks on to sse what is being shown to such an experienced user. Here we see Sebastian OneCNC Poland demonstrating OneCNC to a group of prospective users. Sebastian speaks he first language Polish but is also fluent in Germany allowing a broad range of communication skills in demonstrating and supporting OneCNC Products. Allan OneCNC Denmark (second from right) showing his experiences in OneCNC to Uwe OneCNC Germany (left}. Allan has many years of practical experience in the industry and an accomplished 5 axis designer programmer and CNC machinist. OneCNC Is fortunate to have such a depth of experienced engineers. 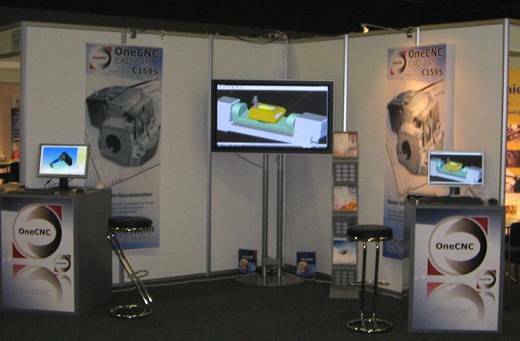 OneCNC Benelux exhibited at the Efficient Verspanen show 9-10 October 2007. The exhibition was held at Koningshof in Veldhoven Netherlands. Neil OneCNC Benelux and Uwe OneCNC Germany attended this show. The six-day EMO Hannover 2007 exhibition ended on Saturday to a shower of accolades. This was because there were more exhibitors, more visitors, more international flair. And this, despite the shortened shortened exhibition by two days from previous. 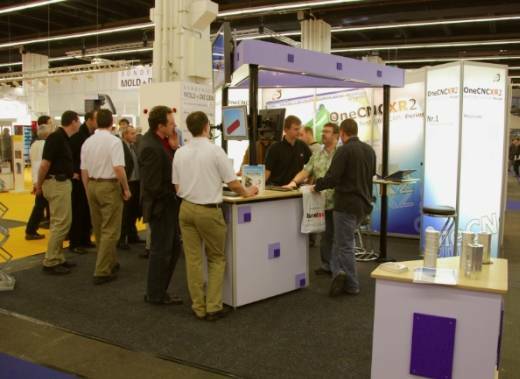 166,500 visitors came to Hannover, Germany between the dates of 17 and 22 September to buy machines, look at CAD/CAM place orders and find out about the latest developments in the world of metal-working. This represented an increase of 4 percent over the previous event two years ago, when EMO ran for a total of eight days. The number of exhibitors 2,120 exhibitors from 42 different countries was up five percent, and the amount of occupied floor space was also up by 12 percent, reaching a total volume of 180,158 net square meters. In attendance on the OneCNC exhibition was Uwe OneCNC Germany, Stephan OneCNC Germany, Sebastian OneCNC Poland, Neil OneCNC Benelux, Allan OneCNC Denmark and Bob OneCNC Australia. Here we see Stephan OneCNC Poland (left) demonstrating the OneCNC features. 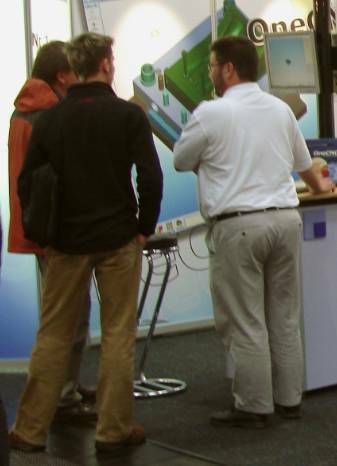 Allan OneCNC Denmark (center) doing a demonstration for customers. Here Uwe OneCNC Germany is demonstrating creating a customers model and machining it. 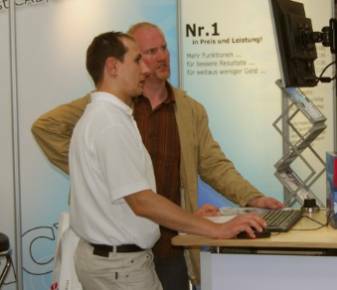 Stephan OneCNC Germany (right) is seen here demonstrating OneCNC features. 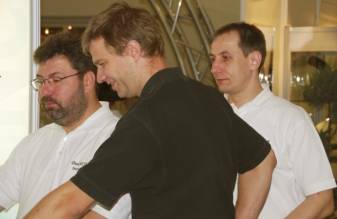 Here Neil OneCNC Benelux (second left) and Uwe OneCNC Germany (third left) doing a combined demonstration.